Erik: I'm going to hold on to you for the rest of my life. "The Commune" brings the story of Eric and Anna. As the movie opens, we see the couple looking at the huge house of Erik's deceased father. The couple really can't afford to keep the house, but at Anna's suggestion, they invite several other people to join them (and pay rent). All together, they are now 9, of which 2 kids (including Anna and Erik's 14 yr. old daughter Freja). Then, just as things seem to go quite well, Erik starts an affair with Emma, a 24 yr. old student of his. What impact will that have on the commune? To tell you more of the plot would spoil your viewing experience, you'll just have to see for yourself how it all plays out. Couple of comments: this is the latest movie from Danish writer-director Thomas Vinterberg, whose work includes 2015's "Far From the Madding Crowd" and before that, the excellent "Hunt" in 2012. Here, after going "Hollywood" in his previous movie, he returns to his Danish roots and brings us a story set in the 1970s, when the concept of morality and conformity were quite different from what we now know them to be. This movie turned out to be a bit different from what I expected it to be. It's not really about "hippies living together and being one with nature", but rather a study of what one man's affair means for the immediate group around him, including of course first and foremost his wife, a slightly aging but very popular TV news anchor. The film also spends quite of time looking at the 14 yr. old girl, and in that sense is also partly a coming of age movie. There are a couple of acting performances that will knock you out, none more so that Trine Dyrholm in the role of Anna, but Ulrich Thomsen as Erik certainly should be mentioned to. 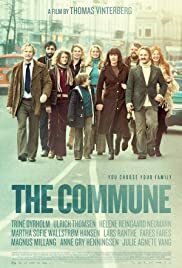 I recently saw "The Commune" at the Landmark E Street Cinema in Washington DC. The Saturday evening screening that I saw it at was attended okay but not super. That's a shame, but maybe this movie will find a wider audience on Amazon Instant Video or eventually on DVD/Blu-ray. If you are in the mood for a quality foreign film that is in part a relationship drama and in part a coming-of-age movie, I'd readily recommend you see this out.